(By Paul Kengor, Spectator.org) – For me, Memorial Day happens twice within a week. The first, the official holiday at the end of May, is quickly reinforced a week later, every June 6: D-Day. Of all the wartime anniversaries, none strike me quite like D-Day — the invasion of Normandy, the liberation of France, the final push to defeat Nazi Germany. 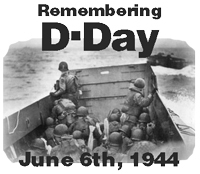 It was June 6, 1944, a date that sticks like December 7, like July 4, like September 11. The mix of extreme sorrow and triumph has been unforgettably replicated on film by Steven Spielberg in the stunning opening of Saving Private Ryan. What must it have been like to be among those first waves at the beaches? Indescribable, simply indescribable. When I think of D-Day, I always think of two presidents, neither of which were president at the time: Dwight “Ike” Eisenhower and Ronald Reagan. What they had to say about the event was profound. Ike was Supreme Allied Commander during World War II, a long way from humble beginnings as a Kansas farm boy. He gave the final order to send an armada of 5,000 ships, 12,000 aircraft, and 155,000 soldiers — the largest amphibious assault in history. The morning prior, the [weather] forecast wasn’t good. Ike asked each of his subordinates what they thought about proceeding. If failure resulted, Ike would take the blame. Of course, failure didn’t result, though a lot of horror came in the process. The men who battled on those beaches sampled their own taste of Armageddon. It was hell on earth. Another 20 years later still, June 6, 1984, another president, Ronald Reagan, visited those beaches, and gave two memorable speeches. The first paid tribute to the men who did return to that beach, and the second acknowledged a man who didn’t return. We stand on a lonely, windswept point on the northern shore of France. The air is soft, but 40 years ago at this moment, the air was dense with smoke and the cries of men, and the air was filled with the crack of rifle fire and the roar of cannon. At dawn, on the morning of the 6th of June, 1944, 225 Rangers jumped off the British landing craft and ran to the bottom of these cliffs…. 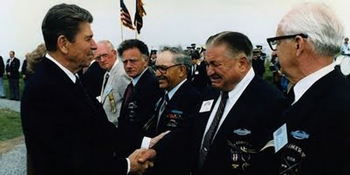 As Reagan spoke, these “boys of Pointe du Hoc,” by then men in their 60s, dabbed their eyes with their sleeves. Indeed, they were the guys who took those cliffs, who helped free a continent, and who ended a vicious war that killed 50 million. Those words of Private Zanatta come to us from his daughter, Lisa Zanatta Henn, in a heart-rending story about the event her father spoke of so often…. When men like Private Zanatta and all our allied forces stormed the beaches of Normandy 40 years ago they came not as conquerors, but as liberators…. Through the words of his loving daughter, who is here with us today, a D-day veteran has shown us the meaning of this day far better than any president can. It is enough for us to say about Private Zanatta and all the men of honor and courage who fought beside him four decades ago: We will always remember. We will always be proud. We will always be prepared, so we may always be free. The video of the Zanatta speech, as well as the Pointe du Hoc speech, need to be seen (click here and here for highlights). This article can’t do justice to the image of Lisa, her mother and brothers weeping as the president of the United States shared Private Zanatta’s words with the world, and as Reagan got choked up delivering them. This past weekend, I spoke to Tony Dolan, Reagan’s chief speechwriter, who wrote such classics as the Evil Empire speech and the Westminster Address, among hundreds of others. What are his recollections about that day in June 1984? “The irony,” says Dolan, “is that the Dublin speech was the big speech.” Dolan was referring to Reagan’s speech to the Irish Parliament on June 4, which indeed was a remarkable speech, albeit largely forgotten. Instead, what stole the show during Reagan’s trip to Europe came not in Ireland but France. Fortunately, no one did. Dolan knew what appealed to Reagan, and Reagan, who had already exchanged letters with Lisa Zanatta, wasn’t about to let it turn into a NATO speech — not with a story like Private Zanatta. “I played a game with myself called, ‘Choke-the-Gipper-up,'” says Dolan with a laugh. No matter how sentimental the thought, the Gipper usually delivered it flawlessly, the consummate communicator behind the camera. But not this time. “I got him on this one,” says Dolan. Perhaps it was that Reagan had what Ike had: He looked at Normandy and he saw not NATO, or strategic plans, troop formations, tactical maneuvers, battlefield gamesmanship, or foreign-policy theory. He saw children, grandchildren, and men like Private Zanatta and the boys of Pointe du Hoc. And that’s who we, too, should see on every anniversary of Normandy. This June 6, let’s remember. Paul Kengor is professor of political science at Grove City College. His books include The Crusader: Ronald Reagan and the Fall of Communism and the newly released Dupes: How America’s Adversaries Have Manipulated Progressives for a Century. First published on Spectator.org June 6, 2011. Reprinted here May 31, 2012 with permission from The American Spectator. Visit the website at Spectator.org. 2. Why does commentator Paul Kengor think of Eisenhower and Ronald Reagan on D-Day? 3. What does Paul Kengor exhort us to do on D-Day?